Dr. Peterside also congratulated Mr Daniel Kajo, an Assistant Chief Public Relations Officer in the Agency for his award as the “Enterprising Public Relations Personality” in the industry. The DG who observed that he was not surprised by the honours stated that the awards were an eloquent testimony of Hajia Tumaka’s dedication, mentorship and passion for her responsibilities which have brought about improved dynamism and innovation in the communication machinery of the Agency. While noting that Hajia Tumaka’s inspiring leadership qualities have positively impacted the Agency and the industry at large, Dr. Peterside urged her and her Team Members not to rest on their oars but continue to fashion out more innovative ways of communicating the ‘Change’ process in NIMASA for the benefit of the entire sector. In her comments, Hajia Tumaka dedicated the award to the Agency in general and her Team Members in particular, adding that this recognition is as a result of the active support of the Director General, Dr. Dakuku Peterside and the opportunity provided her as a staff of NIMASA. Hajia Tumaka who said she was humbled by the kind words of the DG also pledged to rededicate herself even more, to the service of the Agency and the nation. 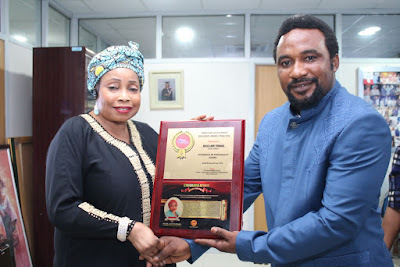 The Fellow of the Nigerian Institute of Public Relations (FNIPR) also thanked Transquest Media Group for the award and restated her commitment to professionalism in the practice of Public Relations. The awards of the Evergreen PR Personality and Enterprising PR Personality were presented to the recipients at the 9thAnnual Transport Development Symposium/Lecture and Awards organised by Transquest Media Group on June 4, 2016 at the Lagos Airport Hotel Ikeja.